Scroll, persist and change direction for choices/cursors. *Fixed the bug from the previous version. Since it has only map-moving event and nothing else to do... Now it should have... - The story progression with some amount of dialogues - Two "Tag Pulling" events about the boy pursuing the girl and the stockings one (the latter has minigame though it's kind of unfinished). - Moving between two rooms, save the game and sleep to end the alpha demo. Sorry for my mistake! Show pictures when choosing a choice. Oh Thank you very much for your great assistance! I'll try those methods and find out the other ways to do it as well. I think I will use the scripts that someone had just modified them for me in the testing stage of the game for now. Since I don't have to make several pictures and I have to write almost no commands at all. But, this will prove useful if I want to use as less scripts as possible, when it doesn't compatible with other necessary scripts, when I want more beautiful pictures and texts (the script use the font as texts on the choice pictures), when it doesn't support some language (i.e. Thai) or if the scriptors don't allow me to use them in commercial game or modify them . There seemed to have so many troubles involving with script... I'll be more careful and looks into things better next time before coming right away to ask for a script. At least I will asking for the modification of an already existing script or asking it in event section until it is confirmed that it can only be achieved by the script. Thank you for all of you and sorry for the trouble! I'm not sure if I made a mistake as a non-native myself. So, I will try to clarify it once again. The real issues are to make the pictures to act as choices and to show the small picture while I'm still in the choice box while I can still move the cursor up or down, not when I press the confirm button to select any choices. Since you can't include much of an event within the choice name, I have no idea how to make these possible without script. I can handle an event after the player choose any choices just fine so that wasn't the problem for me here. I just tell everything so that you could see what I want better. 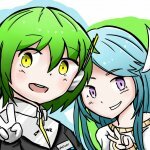 *[UPDATE] - I already got this done by using Galv's Visual Novel Choices and Hime's Choice Move Handler with some modifications made by someone who came to help me just like you guys. * But, it still has some limitations and a compatibilty. I will still trying to clarify things and see if it could really be able to achieve with events or other new single script. After that's done, this thread can be closed. You can skip this post if you're no longer interested in talking. @Traverse Thank you for suggesting me with using an event! Although, I'm still not sure how it could be done. I posted here in the script request because I found Galv's Visual Novel Choices script which turned pictures into choices and Hime's Choice Move Handler script which can show pictures when you're at a choice with some modification, but there are some limitations and all so I didn't use it and look for a better script or other ways if possible (before an UPDATE). Since they made a script, I just assumed that this kind of thing can only be done with a script, or at least it can make things easier. I supposed I'm just still inexperienced. As for your suggestion, I still have no idea how it could work. I'm sorry that I don't quite understand this. Did you mean that I should make a pseudo-choice selection with Show Picture > Conditional Branch > Button Pressed instead of the system choice? Let's say I used Show Pictures to show 5 pictures, maybe A B C D and E. My current choice location is A. Then, I have to use Conditional Branch > Button "Down" Pressed to show the small picture for B and so on? Or did you mean including the process with an actual choice system? I had thought the choice took priority over Common Events, Parallel Process and an a Timer (the choices cannot vanish by itself without a script, like Hime's Window Timer.) by default. So, unless I finish the choice selection and get out of that, those events couldn't be able to run. That also means for Move Picture > Zoom Width/Height as well. I don't think that event will run until I am out of a choice selection. If that's a mistake, I would like to apologize. @Ninjamida Thank you for your interested! - To clarify - you want to display a specific background picture (presumably one that might be different at different times throughout the game), display the options (also as images) on the left with a selection graphic, and some kind of "preview" image relating to the currently highlit choice on the right. Is this correct? > Yes! I know how to do the first one (display a specific background picture) with simple event, maybe. The problems are the second and third problems since a default choice system seems to take a priority over a lot of events. - What do you actually want to *do* when the player makes their selection? Not in terms of the ultimate outcome, but what immediate (on the technical side) effect do you want it to have? Set a variable? Set a switch? Call a common event? Or do you perhaps want it to replace the current functionality of the "Show Choices" event command (keeping in mind that RMVXA's interface only lets you enter four options for this, even though that's literally just a limitation of the editor and there's no reason the actual engine can't handle more) > If I understood it correctly, then that wasn't my problem at all! I know what to do after the player makes their selection. But what I want is while the player are moving the cursor to any choices and the different pictures will show up when the cursor is at the different choice. Since I already got how to do this, you can skip my request with ease! But, if you still want to help with better script in a single one, that would be appreciated as well. Sorry for confusing both of you by any means! And if this seems selfish and relying on others too much, I sincerely apologize! All the fault lies with me.. I'll be more cautious next time! *I tried to quote and I can't delete this orz.